This indispensable guide on narcissism helps you recognize, cope with, and ultimately overcome the destructive behavior of narcissists. Everyone needs some healthy narcissism. However, in a society obsessed with appearance, wealth and status, it's easy for destructive narcissists to thrive. Typified with an obsession with perfection, desperate need for admiration from others, and a willingness to use and exploit people close to them for personal gain, high-level narcissism can spell devastation for anyone who crosses the narcissist's path. 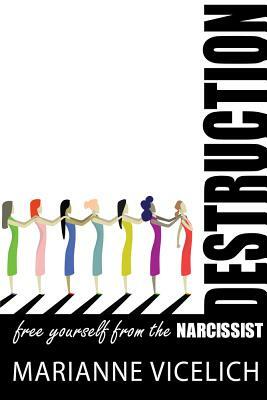 Destruction shows you how to liberate yourself from draining personal relationships with narcissists and regain a sense of peace, balance and well-being in your life. Marianne Vicelich is the author of eight published self-help books and she is a self-love therapist and relationship coach. Her work merges empowering psychology with realistic and tangible verse. Her work has been featured in Vogue, NBC Radio, Fox Radio, Harpers Bazaar, BBC Radio London, OK Magazine, Cosmopolitan, The Los Angeles Times and more. She is a practicing psychologist.